Guys! 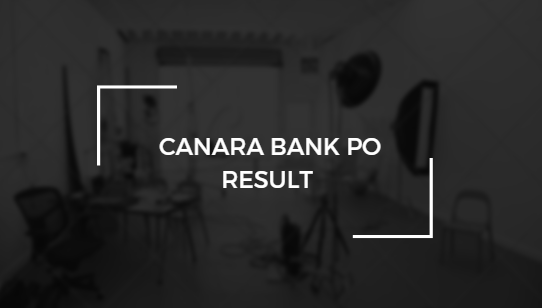 The Canara Bank has uploaded the result of PO (Probationary Officer) on its website in recent times. See the list of shortlisted candidates who have been called for the next rounds i.e. GD (Group Discussion) and PI (Personal Interview). Wow! Canara Bank just posted a PDF of Canara Bank PO Result 2018 containing the names of those candidates who have been found suitable for the various posts of PO (Probationary Officer) in JMGS-I after analyzing their performance in the online written test that was carried out on 4.03.2018. The LOC (list of candidates) can be downloaded via the direct link shown beneath. The list lists the names of contenders who have been shortlisted for Group Discussion (GD) and Personal Interview (PI) on successful completion of PGDBF Course. Q. How many candidates have been shortlisted? A. The total number of the candidates who have been shortlisted is 1397. Q. What does list show? Well, it is just so easy to download your Result of Canara Bank PO 2018 – all you need to do is use the steps or direct link given below. Log on to the main website of Canara Bank, viz. https://canarabank.com. Now, locate the link to "Careers" at the bottom. Click on it and find the 'Recruitment' section. Now, you will be able to see the fresh link to 'PO Exam Result' there. Click on result link to open the PDF. If the link to Canara Bank PO Result 2018 does not open, you can use the direct link attached beneath to download the result right away. Best of Luck to all of the candidates!